LIO Device Kit has a 400mAh built-in battery which can be charged via a USB cable. If you always want to know your power consumption, the LIO Device will be a good choice. LIO Device Kit has a 400mAh built-in battery which can be charged via a USB cable. If you always want to know your power consumption, the LIO Device will be a good choice as it comes with the LED battery level indicator light. The side fire button will make the operation much easier. 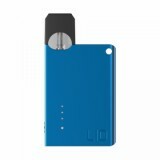 If you are looking for an ultra small and compact size e-cig, LIO Device kit will be a good choice. • You can also choose LIO Device Replacement Pod and LIO Device Battery in BuyBest. Bought a red LIO for my sis. She loves its neat design and simplicity. Performance is good so far. Thanks for the nice service and fast shipping. A simple portable vape pod for daily use. So far so good.